As we’ve experienced previously, when traveling over a holiday, especially Thanksgiving or Christmas, you need to do some research before you travel so that you know what may be available to you in terms of meals during holidays on the road. You can’t expect that same types of eateries or restaurants that are open on holidays at home will be available to you when you’re traveling. Thanksgiving, especially since there’s such an emphasis on family and family gatherings, tends to be a difficult holiday to find many food options for, especially if you don’t plan ahead since most restaurants are either closed, or those that aren’t tend to fill up quickly as others begin to realize that the options are limited. In preparing for our trip to Washington, D.C., we looked over the various options available to us for our Thanksgiving dinner meal and tried to pick a restaurant that served a variety of food, where we could still order off of the restaurant’s regular menu rather than being forced to order off of a set holiday menu so that it would satisfy the taste buds of everyone in our party. While we found quite a few restaurants that were actually open for Thanksgiving dinner, very few either didn’t cost and arm and a leg for a meal, or actually allowed ordered off of the restaurant’s regular menu. After narrowing down our choices, we decided to go with the restaurant that we thought would be the most laid back and relaxing restaurant and take our chances. 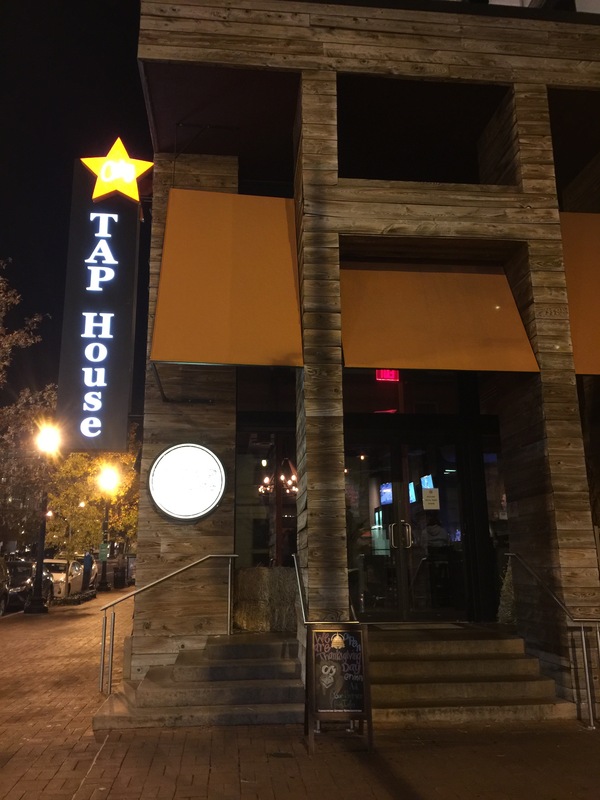 Located in DC’s downtown entertainment core and close to Chinatown and shopping, City Tap House is a good old-fashioned brewhouse. Offering craft beer from around the country and around the world, this “rustic, yet comfortable” brew pub serves brunch on weekends, and is open for lunch all the way into the late night/early morning hours the rest of the week. But it’s not just the drinks people come for, it’s also what they describe as “elevated, American pub fare,” that includes brick oven pizzas and classic burgers you’d find in any gastropub, with a few surprises thrown in. The interior of the restaurant was relaxed and casual with a large open dining room and a large bar area. 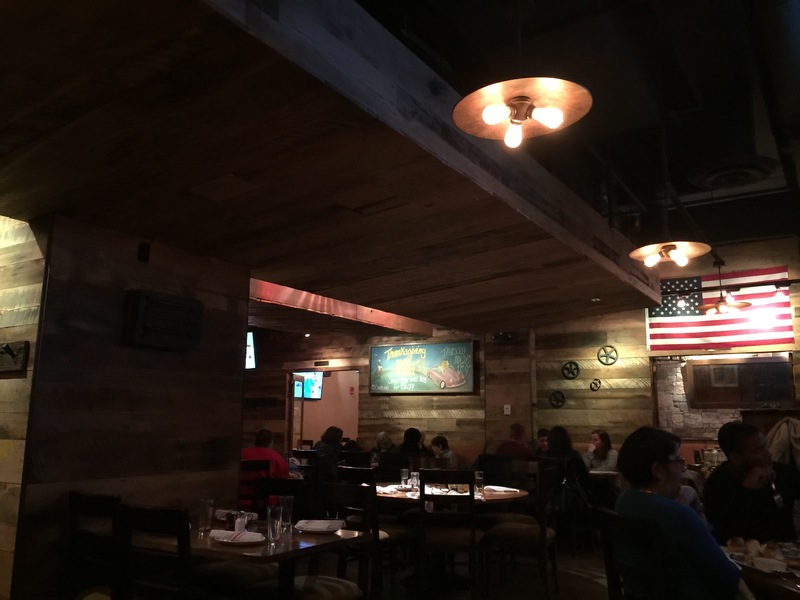 The wood-paneled interior decor was very Americana and rustic with dim-intimate lighting, a large US flag as decoration as well as some wrought iron design pieces, and somewhat of a mid-western vibe to the atmosphere. While dinner service was bustling on Thanksgiving evening, it wasn’t jam packed, which was nice. And somehow seemed to be mainly locals rather than out-of-towners as our waiter seemed to be blown away by the fact that we came from California all the way cross country to not only spend our holiday in Washington, D.C., but our dinner at the restaurant. 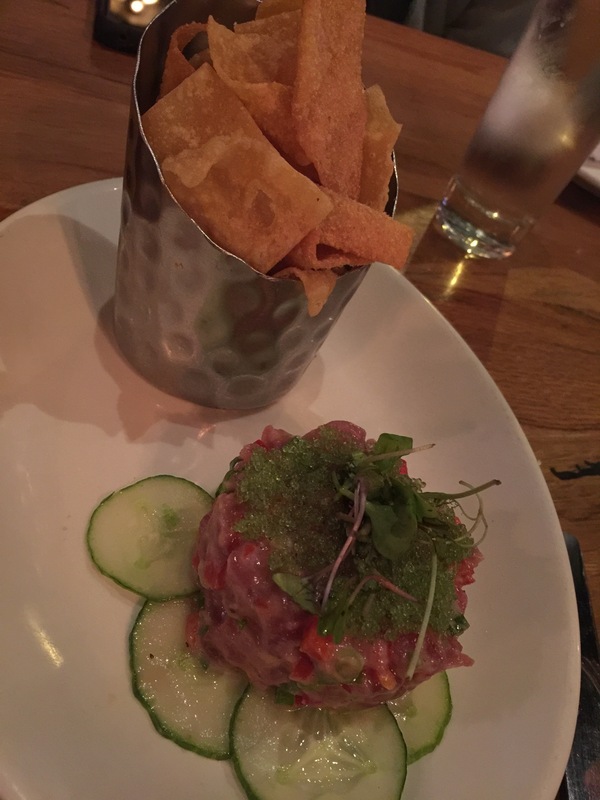 We started our meal by ordering an appetizer of yellowfin tuna tartare. Made with scallions, cucumbers, red pepper, wasabi tobiko and yuzu-ginger dressing and accompanied by wonton strips, this tartare was fresh and full of flavor. I really liked the use of wonton strips as an accompaniment to the tartare, the wonton strips were crispy and crunchy and a flavorful compliment to the yellowfin tuna. I could have done without the red pepper in the tartare itself, but then again, that’s just me as I don’t like peppers. The tartare itself was fresh and the yuzu-ginger dressing was fantastic. The dressing made the tartare tart and tangy and incredibly flavorful. The use of thin-sliced cucumbers was cool and refreshing and provided for such an interesting texture combination. My mom decided to order the classic margherita pizza for her dinner. 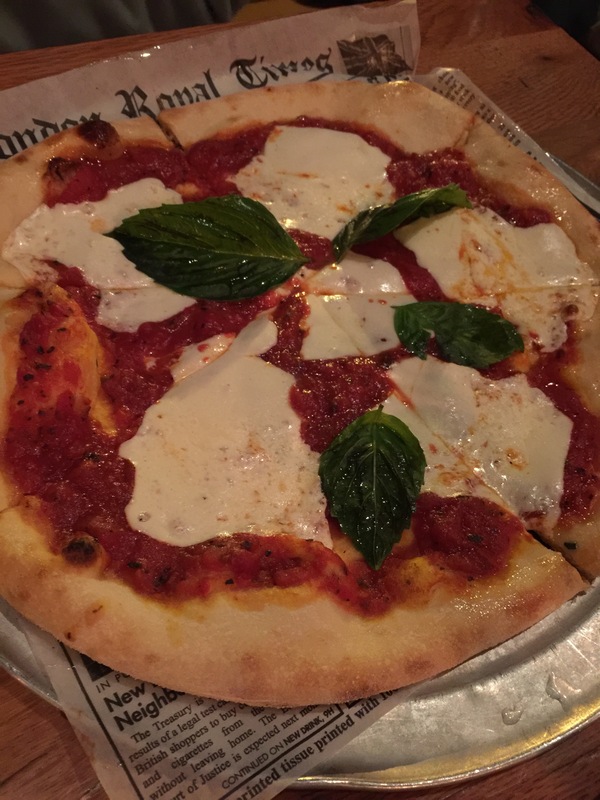 As the menu describes, the is a classic with tomato sauce, fresh mozzarella, extra virgin olive oil and basil. The pizza was a terrific size for an individual entrée. The dough was yeasty and doughy, which worked for my mom, and the tomato sauce was tangy. Just the right amount of fresh mozzarella that was nice and melty and the clean, rich taste of the olive oil made for a pizza meal that my mom could enjoy. 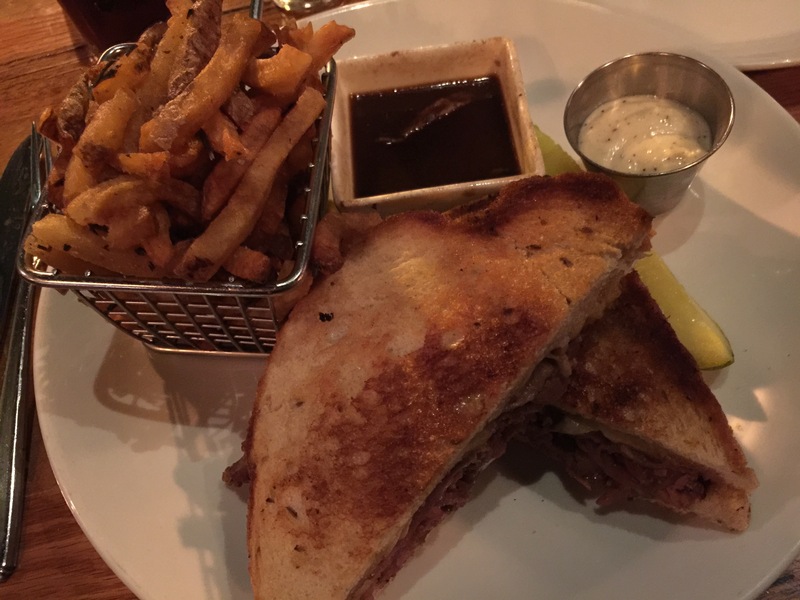 I ordered the rye French dip made with shaved ribeye, Gruyere cheese, bourbon mustard, porter au jus on country rye and served with duck fat fries. I was a bit concerned about the rye bread as I don’t really love seeds in my bread, but the bread that City Tap House chose for the sandwich was actually pretty good, nice and thick cut and though you could taste the rye, it wasn’t studded with seeds all over. The sandwich was perfectly cooked and incredibly crunchy and crispy, which I really loved. The shaved ribeye was fantastic with the meat being nice and medium rare and combined with the Gruyere cheese it was just delicious. The difference in this French dip was how flavorful and perfectly cooked the ribeye was, that was definitely the star. The duck fat fries were fantastic as well, so rich in flavor and nice and crunchy and crispy on the outside. The fries were thick enough that the inside was still soft and tender and full of potato. The sandwich and the fries were such a delicious combination together. My dad and my husband both ordered the Tap burger, the restaurant’s signature hamburger. 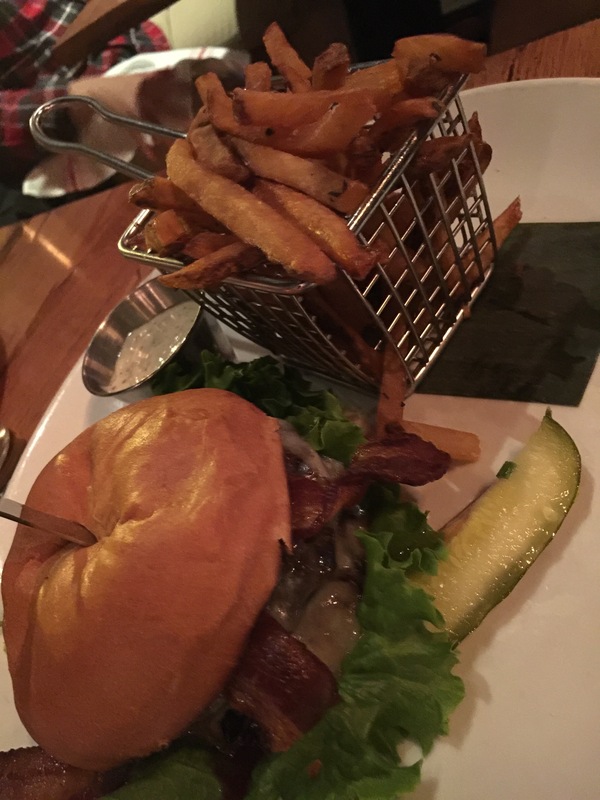 Eight ounces of all natural ground beef topped with Lancaster rustic cheddar cheese, agrodolce onions, beer gastrique, toasted brioche and again served with duck fat fries with a truffle aioli dipping sauce created a fulfilling meal. My husband decided to up the flavor factor in his burger by adding Benton’s bacon. My husband was so excited by the duck fat fries that he dug into them first and devoured the whole thing. Anything cooked in duck fat can’t be bad, and my husband can’t resist ordering it. Both my husband and my dad loved their burgers. They thought that the flavor of the burger patty was outstanding. The cheese added a nice tang, and the agrodolce onions and the beer gastrique added the wow factor to the burger with tons of flavor. This was definitely a burger worthy of a brewhouse. We were all so full by the end of dinner that we didn’t even have room to consider ordering dessert. Although this wasn’t the world’s fanciest Thanksgiving dinner, this worked for our family. A really relaxing, fun atmosphere, a shared family meal that we all enjoyed, was really what it was all about. We were never looking for a fancy Thanksgiving dinner meal, my family just doesn’t operate that way. What was important to us was finding a place that served good, old fashioned food that could satisfy all of our tastes. City Tap House was just fun, from the minute we walked into the restaurant, the atmosphere was relaxed and laid back and it was all about providing guests with a good time with good food.